The city of Harbin is the capital of Heilung Kiang province in northern Manchuria, northeast China. In the 19th century, Harbin was not a city, but only the general reference to a cluster of small villages on the banks of the Songhua River. Harbin’s development began with the start of the Russian invasion of Manchuria towards the end the 19th century. The Russo-Manchurian treaty of 1897, granted Russia the concession to build the Chinese Eastern railway and Harbin then became its administrative center with a 50 km. wide zone along the railway. The chief engineer of the building board of the Chinese Eastern railway was Alexander Yugovich. Born into a Jewish family that converted to Orthodox Christianity, he was a civil engineer and specialist in constructing of railways in deserts and highlands. The Chinese Eastern railway was to cross Manchuria, Harbin, Pogranichny, and Changchun with Port Arthur in Korea as its final destination. The construction of the line began in August 1897 and opened for traffic in November 1903. In the same year, several Russian Jewish families moved to Harbin. They had the approval of the Czarist government that was interested in developing the area as rapidly as possible. The Jews who settled in Harbin were granted better status than were the Jews in Russia. The Jews, along with other minority groups, such as Karaites, were granted plots of land on the outskirts of the town. They were not allowed to work directly on the railway. With the development of the area, however, they were able to establish businesses as shopkeepers and contractors. By 1903, a self-governing community of about 500 Jews existed in Harbin. After the Russo-Japanese war of 1905, many demobilized Jewish soldiers settled in Harbin. They were followed by refugees from the 1905-07 pogroms in southern-western Russian guberniyas (regions). By 1908, there were about 8,000 Jews in the city. The growing Jewish population decided to build a new synagogue, which was called the “Main Synagogue”. It was built on Artilleriiskaya street, in the Pristan’ district (now Tongjiang street, Daoli district). Its foundation was laid on May 3, 1907 and the building completed in January 1909. The first Jewish cemetery in China was opened in Harbin in 1903, which later had more than 2,000 tombs. Several institutions came into being within the community, including clubs, a home for the aged, and a hospital, which provided care for Jews as well as the general population. 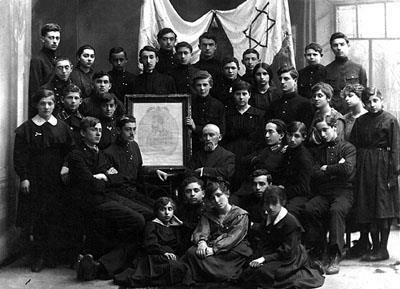 A heder (religious elementary school)was established in Harbin in 1907 and a Jewish secondary school (Evreiskaya Gimnaziya) in 1909, which had over 100 pupils by 1910. Seventy percent of the Jewish pupils, however, attended non-Jewish schools since there were not enough classes for in the Jewish schools in Harbin. In 1913, the chief rabbi of the Jewish community of Harbin was Alexander Kisilev (1866-1949) – author of several works on halakha and books (Natsionalizm i evreistvo – “Nationalism and Judaism”) which were published in Russian in 1941. 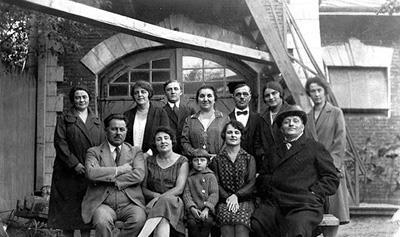 Family dynasties, such as the Bonner, Kabalkin, Krol, Mendelevich, Samsonovich and Skidelsky families, played an important role in development of the local industries, especially wood and coal industries. They were also instrumental in expanding trade relations with the Russian empire as well as European countries, Japan and the United States. In November 1914, following the outbreak of the World War I, the Jewish community of Harbin joined EKOPO (Jewish Committee for the Help of War Victims). This voluntary organization was active during the war years and disbanded in 1920 under the demand of the Bolsheviks. For example in February 1914, Dr. Abraham Kaufman, head of the Harbin branch of EKOPO, received a telegram from the Committee of Assistance to Pogrom Victims from the city of Samara on the Volga River with a plea for assistance. During their operation, EKOPO helped more than 200,000 war refugees. The Committee organized distribution of food among refugees, established dormitories, hospitals, professional courses and more to help the people. The Jewish community was sharply increased by the influx of Jewish refugees during World War I, the Russian revolution (1917), and Russian Civil war. It reached its peak, 10,000 – 15,000, in the early 1930’s, but declined to about 5,000 in 1939. Several Jewish organizations were established in Harbin. Among these was a Jewish secondary school (1919-1924), Talmud Torah (later Jewish national school 1920-1950), a hospital Mishmeret Holim (1920-1934), a hostel for aged people Moshav Zkenim (1920-1943), a school for professional education for women (1922 – 1940), a Jewish library as well as the “New Synagogue”. Group of Betar members. Harbin, 1936. The Oster Visual Documentation Center, Beit Hatfutsot. Courtesy of Riva Balinsky, Israel. A Jewish National bank was created in 1923 following the efforts of A.M Pataka, D.N. Ganansky, Dr. A Kaufman, M Y. Elkin, M.I Trotsky, Dr. S.M.Vechter, G. B. Drisin, M.I Schister, and Y. Beiner that initiated this project already in 1919. The bank’s prime customers were Jewish businesses in need of cheap credit, but later it also catered to the needs of the wider business community. The bank ceased operation in 1950. The city’s first branch of modern hotels, banks, shops, cafes, newspapers, and publishing houses were initiated by members of the Jewish community and helped boost the city’s business. Practically all enterprises in Harbin at that time, whether bakeries or coalmines or mills, were closely connected with Jewish economic activity, in addition in 1926 there were 28 companies owned by Jews. Harbin also was a well-known cultural center. During the 1920’s and 1930’s, many famous Jewish actors came to Harbin to give performances. These helped promote the spread of western music in China where the Jewish influence on Harbin music education can be seen today. Between 1918 and 1930, about 20 Jewish newspapers and periodicals were also established. All were in Russian except the Yiddish Der Vayter Mizrekh (“The Far East”),which was published three times a week. It had a circulation of about 300 copies in 1921-22. The Russian-language weekly Yevreiskaya Zhisn’ (“Jewish Life”, which until 1926 was called Sibir-Palestina) appeared from 1929 to 1940 with a circulation throughout Manchuria and north China. An English supplement was added to coincide with the establishment of the Jewish National Council in the Far East. 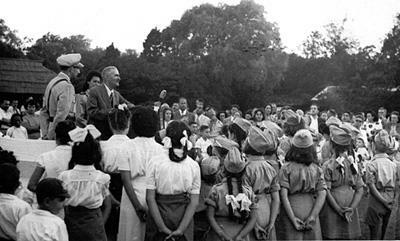 The Zionist movement, led by Abraham Kaufman, and several youth clubs played a major part in the life of the community. Until 1921, Zionists of Harbin were affiliated with the Russian and Siberian Zionist organization and participated in their conferences. 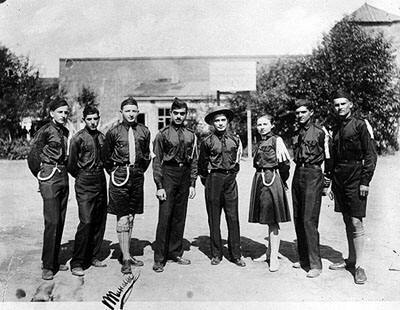 To further the activities of the Zionist movement a branch of the Maccabi Jewish youth movement was established in 1921 and it functioned until 1925. The Harbin Jewish Women’s Association linked to WIZO was established in Harbin in 1922 and the first meeting of WIZO was held the same year. From 1921 to 1925, several groups of youths from HaShomer HaTzair Zionist movement emigrated to Palestine. 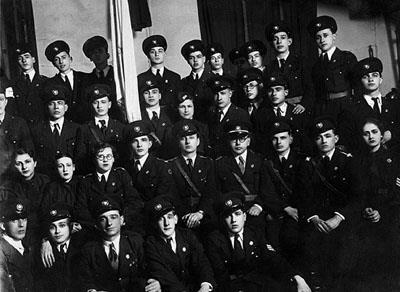 The Harbin branch of the HaShomer HaTzair was set up in 1927, and in 1929, the Zionist youth movement Betar was founded, mainly by a large group of former members of the HaShomer HaTzair movement. The introduction of the New Economic Policy (NEP) in the Soviet Union, in 1925, stimulated another wave of Jewish emigration, some crossing the borders illegally while others received assistance from the Jewish community in order to pay the large amounts of money in foreign currency required by the Soviet government for issuing visas. When Zionism was outlawed in the Soviet Union, Harbin became an island of Russian-language Zionism. In the years from 1924 to 1931, the Soviet regime, largely preoccupied with internal problems, exercised limited influence on Manchurian territory. In 1931, the Japanese army occupied Harbin and the Manchurian territory. 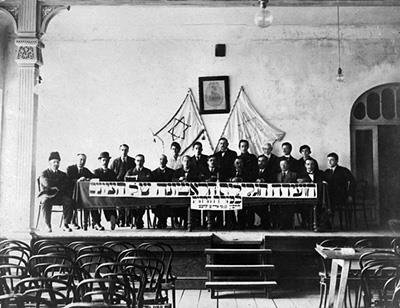 The first of three Zionist conferences of the Jewish communities of the Far East was held in Harbin in December 1937. During this first conference, because of ideological differences, a revisionist Zionist wing moved to lead an independent political activity. The Revisionist-Zionists held three more conferences, which were attended by Japanese and Manchurian authorities. The Japanese tried to use Harbin and Shanghai Jewish communities to entice western investment into their “co-prosperity sphere”. At the second conference, the possibility of a Jewish flag was proposed, green, and white with a Star of David or blue-white flag of the Zionist Revisionist party. The Japanese maintained relations with the Jewish communities of Harbin and Shanghai, hoping, through them, to win investment and favorable influence from western Jews (the so-called “Fugu plan”). The second conference was held in 1938 and the third in 1939. At the last conference, discussions were held of the possible integration of German and Austrian Jews who sought refuge in China. These conferences were important in leading to the consolidation of the Jewish communities of China. The Japanese authorities did not allow the fourth conference that was supposed to be held in 1940. Under Russian rule, the Jews of Harbin enjoyed the same rights as all other foreigners, and were left alone to develop in their own way. However, in 1928, when the Chinese Eastern Railway was handed over to Chinese, an economic crisis broke out and many Jews left Harbin. Some went to the Soviet Union, others to Shanghai, Tien-Tsin and other cities in China. This situation changed drastically for the worse with the Japanese occupation of Manchuria (1931-45) and the establishment of a puppet regime, under which Jews were subjected to terror and extortion. A native of Mglin, a tiny Jewish village near Chernigov, Russia. On his mother’s side, he was a great grandson of Zalman Shneerson, the founder of the Chabad movement. In 1903, he graduated from gymnasium in Perm, Russia, where he was drawn into Zionist activity. He began his studies of medicine in 1904 at the University of Bern, Switzerland. In 1908, he decided to return to Russia, then settled in Harbin in 1912 and became involved in community life and international Zionist activity. Kaufman was elected as vice-chairman of the National Jewish Council of Siberia and Ural. Between 1919-1931 and 1933-1945 he was a chairman of the Jewish community of Harbin, chairman of the Jewish National Fund and Keren Hayasod; board member of the World Zionist Organization and the Jewish Agency and chairman of the Jewish Zionist organization of China. Kaufman inspired the activity of practically every cultural and community organization of Harbin Jews. During 1921-1943, he was a chief editor of the Evreiskaya Zhizn (“Jewish Life”) – a weekly magazine in Russian. He served as medical director of the Jewish hospital of Harbin. In 1937, he was chairman of the National Council of the Jews of Eastern Asia (Far East). In this position, Kaufman succeeded in persuading the Japanese occupational forces to abolish the decision of their German allies to concentrate the Jewish population into special ghettoes. He was arrested in 1945 by Soviet Red army accused of collaboration with alien forces and spent eleven years in a labor camp. In 1956, he moved to Karaganda (now a city in Kazakhstan) and in 1961 immigrated to Israel where he died in Tel Aviv in 1971. The origin of the name Olmert is not known, even to the members of the family. Mordechai Olmert’s great grandfather was kidnapped as a young child by the Tsar’s army and forced to serve in it for 25 years. When finally released, he settled in the city of Samara on the River Volga, and when asked for his name, gave it as Olmert: possibly remembering it in a distorted way from his childhood. Mordechai was born in 1911. The family prospered in Samara, but their days of peace and happiness there were numbered. The Bolshevik Revolution of 1917 unleashed all the anti-Semitic forces both Red and White, and the Jews of Samara, as in so many other places, became the classic scapegoats. The Olmert family fled what had become a madhouse, to Manchuria in Northeastern China, where they had business connections, and where Jewish and Russian Christian Communities were emerging as part of a Russian drive towards Manchuria. The Olmerts settled in the town of Tzitzikar near Harbin. Young Mordecai Olmert aspired to move to Harbin, where, with its 10,000 Jews, he believed he would be able to pursue his growing interest in Jewish affairs. The family finally settled in Harbin in 1927. 16 years old, Mordechai Olmert was drawn to Zionist activity, but he was not satisfied with the only movement in Harbin at that time: HaShomer HaTzair. Together with his fascination with the personality of Ze’ev Jabotinsky, the ideology of the Revisionist Movement swayed him, and thus began his life long dedication to it. Convincing a group of other young people, he established a local chapter of the Betar Youth Movement, an involvement that became the focus of his life. There, at that time he met his life-long partner and companion, Bella nee Vugman, herself a dedicated member of Betar Movement. Betar became the dominant movement in Harbin, and Mordechai was forever proud of the fact that many Jewish members of other movements, including communists, joined Betar. Unlike many other Jews, Mordecai insisted on studying at a Chinese rather than Russian High school: he never in his life forgot the Chinese language. In 1930, Mordechai left Harbin, beginning his long road to Palesitne, first stopping in Holland to study Agriculture at a Hachshara farm. He arrived finally in Eretz Israel only in 1933, and for 14 years he and his wife Bella were active in missions for the Irgun Zva’i Le’umi (Ezel) of the Revisionist Movement. However his connection with Harbin had not ended. In 1947, Mordechai was ordered by Menachem Begin, the Chief Commander of the Ezel, to raise funds for the ship Altalena. Mordechai headed for China, visiting Jewish communities there, gravitating to Harbin. His charismatic appearance helped raise the needed funds: the Jewish ladies threw their jewelry on the table to him. Mordechai Olmert felt that he had come full circle. Mordechai was a lifelong activist in the Revisionist Movement, later Herut, serving as a member of Knesset (1955-1961), and heading the Settlement Department of the Herut Movement, through which he founded various villages and towns all over Israel. He retired to his farm in the village of Binyamina, where he passed away in 1998. The biography of Mordechai Olmert was contributed by Linda Olmert. The attitude of the authorities towards the Jews became even more oppressive in the World War II (1941-1945) when the Japanese, as Axis partners, and under the influence of Russian right-wing émigrés, adopted an anti-Semitic policy. During Japanese rule, Jewish national life was kept alive by the Zionist youth movement, particularly Betar and Maccabi who organized Jewish cultural activities. Betar, which was the strongest Zionist youth organization, published a Russian-language magazine Ha-Degel (“The Flag”). Alexander Y. Gurvich as editor headed it until his departure from Harbin in 1941, when the position was taken by Shmuel A. Klein, who edited the magazine for a year until the Japanese closed it in 1942. In 1943, under the pressure of the German Embassy in Tokyo the Japanese authorities in Harbin ordered the closing of the ”Jewish Life” magazine. Four synagogues functioned in Harbin until 1950. 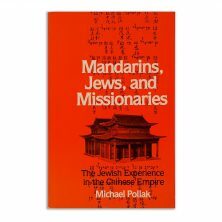 Many Jews left Manchuria before the outbreak of World War II, emigrating to the U.S., Australia, Brazil, and other countries. During 1945-47, Harbin was under Soviet occupation. Jewish community leaders were then arrested and sent to the Soviet interior. Rabbi Alexander Kiselev, the Chief Rabbi of Harbin and the Jewish Communities in the Far East passed away in Harbin in 1949. The same year an illegal Jewish Committee was formed in Harbin. It was headed by Shlomo Spivak, representing the Zionist Movement, Teddy Kaufman, and Pavel Shmushkovich representing Maccabi, Yacov Tandlet, Boris Mirkin, and Vera Klein representing Betar. However, Most Jews of Harbin emigrated to the West in the years after World War II. During 1951-1953, about 3,500 of the former “Chinese” Jews, most of them from Harbin, settled in Israel where they established a society of Chinese Jews. The cemetery was moved from its old location to Huang Shan during 1968-1962, the year that marked the end of the Jewish community of Harbin. The last Jew in Harbin left in 1985. Old Jewish schools, streets, and houses are kept intact or have been renovated. Among these old buildings are two synagogues, a rabbinical school, and the biggest Jewish cemetery in the Far East, in which there are about 700 gravestones with Hebrew inscriptions. 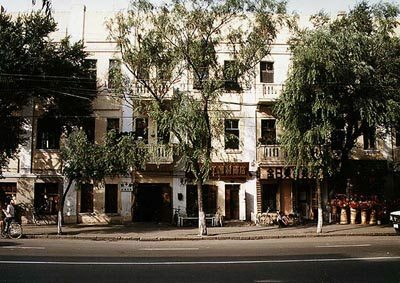 One of the prominent reminders of the Harbin Jewish community is the architecture of the old districts of Harbin with the former Jewish quarter serving as a major tourist attraction. Most of the elegant old Western-styled buildings, dating to the early 1900’s, which were built by the Jews, have been well preserved. They are scattered throughout the entire city, especially in the neighborhood of Pristan’, an area that used to be the center of the religious, political, economic and cultural activities of Jews of Harbin. In the early 2000’s, Jews who represent Israeli and other international companies are renewing their business interests in Harbin and other principal Chinese cities. A Jewish Research center was opened in Harbin in April 2000. It is affiliated with the Heilongjiang Academy of Social Sciences. The Center’s director, Li Shuxiao, has visited Israel twice. One of the Center’s major projects is to reconstruct the history of one of the largest Jewish communities in the Far East that was centered in Harbin.